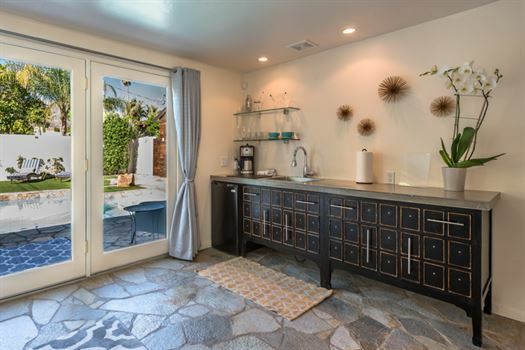 Located in the legendary Movie Colony/Ruth Hardy Park area, only a short walk from the famous Ruth Hardy Park and the main Downtown Strip, this stylishly decorated mid-century home (1940's charm, including original windows intact) has a unique Mediterranean twist and offers wonderful indoor/outdoor space for a private, sun-filled, Palm Springs getaway. 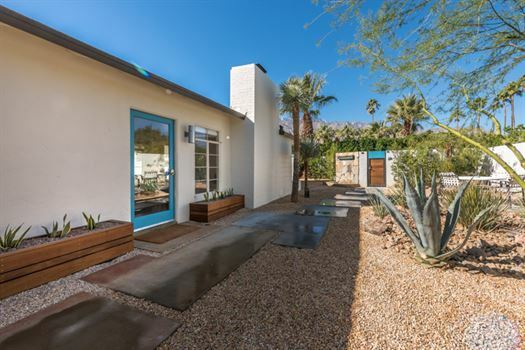 This newly updated and fully modernized home boasts incredible indoor and outdoor space for entertaining, cooking, lounging around, and enjoying all Palm Springs has to offer. 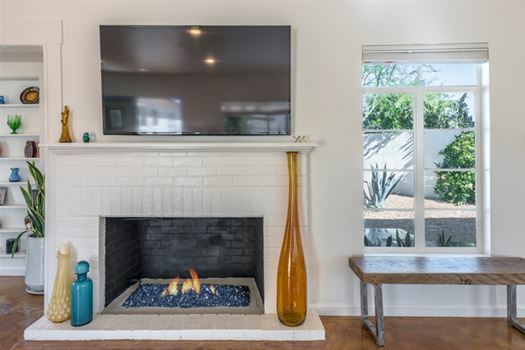 The living room is brightly decorated with a modern mid-century style yet very comfortable featuring a 60" flat screen TV, Sonos music system and cozy gas fireplace. 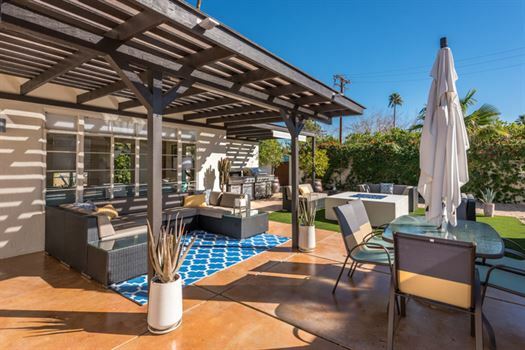 There is a dining area that sits 6 (expands to 8 if needed) and overlooks a meticulously landscaped front yard with its own fountain (fountain lights up at night), and outdoor sitting area. 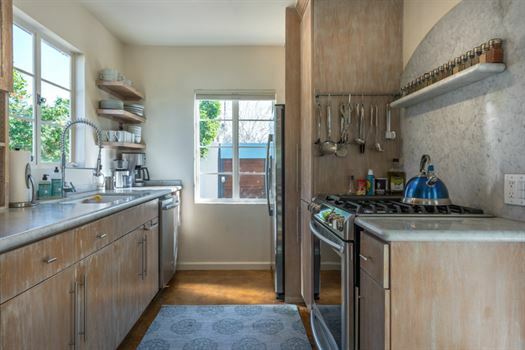 The kitchen is fully stocked with all imaginable items and equipped with new high-end appliances (including a semi-pro Samsung oven). 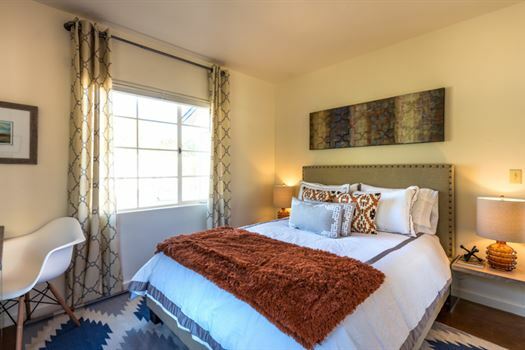 The master bedroom is open and bright, furnished with a very comfortable King size bed and 42" TV. 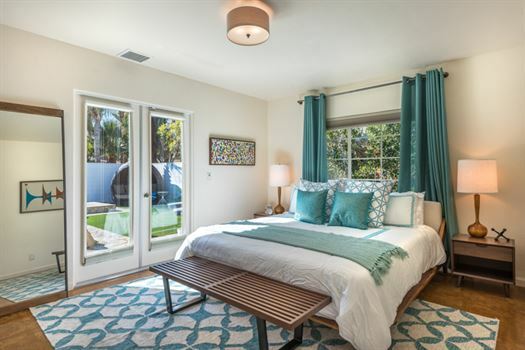 The second guest bedroom is tastefully decorated and has an elegant queen-size bed. 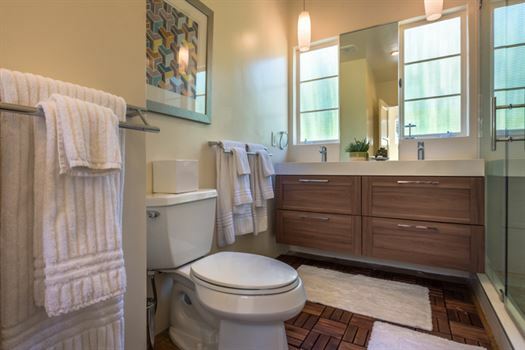 The separate guest house (Casita) features 2 separate bedrooms that share a bathroom. The larger guest suite features a 50" HDTV, a breakfast sitting area and a small kitchenette with its own mini-refrigerator and microwave. 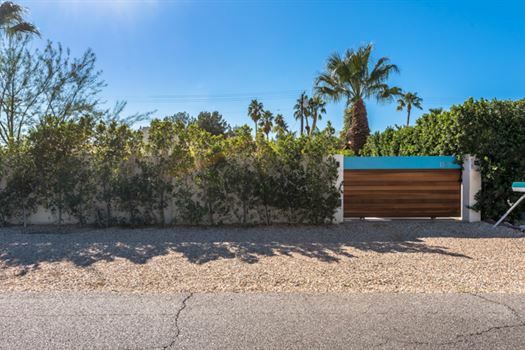 Located in the Movie Colony East area, only a block from the famous Ruth Hard Park and short walk to the main strip on Palm Canyon Rd. 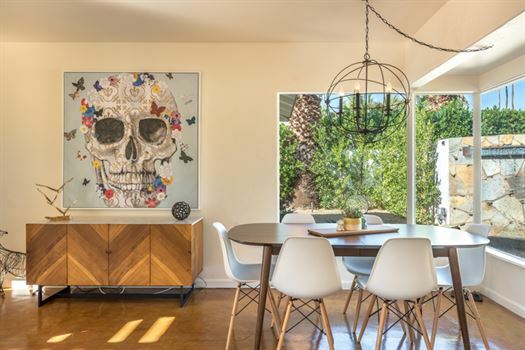 This area has one of the largest collections of mid-century designed homes. 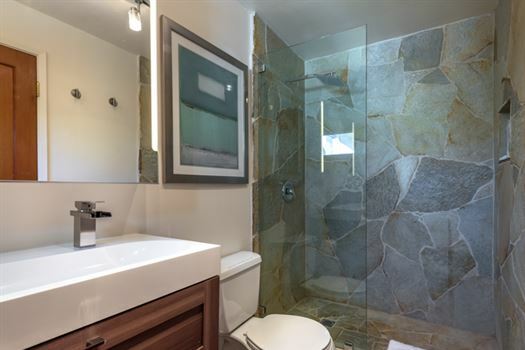 Enjoy the breathtaking mountain views throughout. 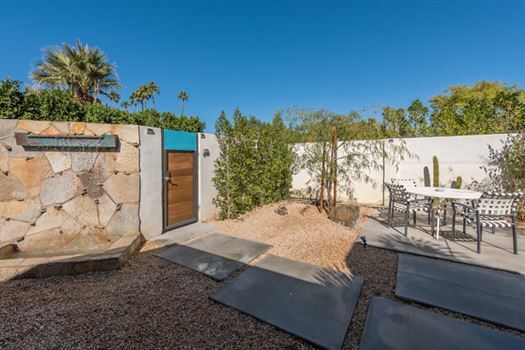 The large private lot is meticulously landscaped with beautiful desert rock, shrubs, agaves, plus beautiful quartz flooring. 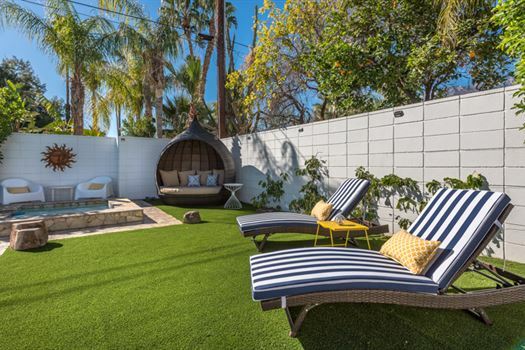 The back yard is very private and features a professional outdoor BBQ/Kitchen. 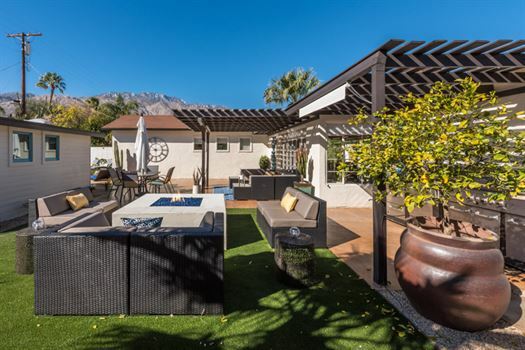 The home has several outdoor sitting areas, including a large covered patio area with a spacious deck, an outdoor Fire Pit with its own sitting area, and a large selection of outdoor patio furniture, outdoor dining table, couches and chaise lounges. 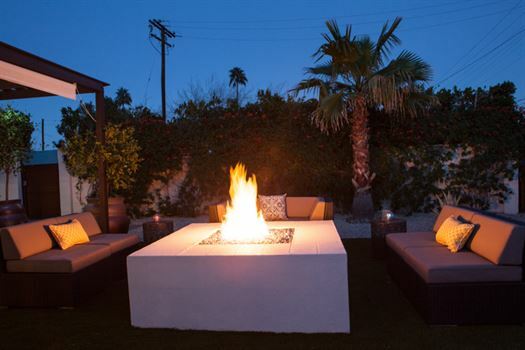 At night, the property has gorgeous views of the Palm Springs Mountains and clear desert sky, accented by the wonderful outdoor Fire Pit and outdoor lighting throughout the property which make the evening as enjoyable as the day. 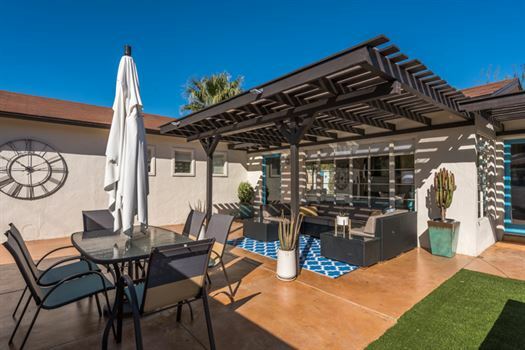 Indigo Dream is well situated just minutes from Palm Springs attractions including, downtown Palm Springs, Ruth Hardy Park, The Palm Springs Aerial tram, Knott's Soak City Waterpark, Palm Springs Outlet Mall, and Palm Springs Airport. 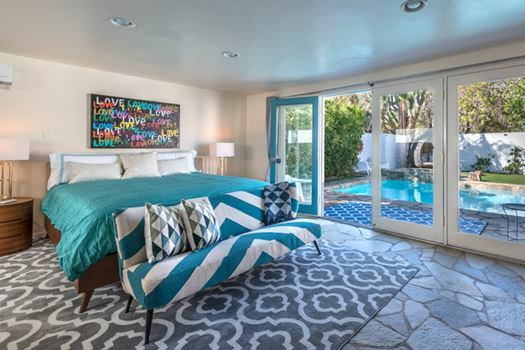 The Indigo Dream is the perfect choice for your next Palm Springs Retreat. This was a great spot with everything you needed for a desert trip. The service was great and the team at oasis rentals was quick to help wherever needed. 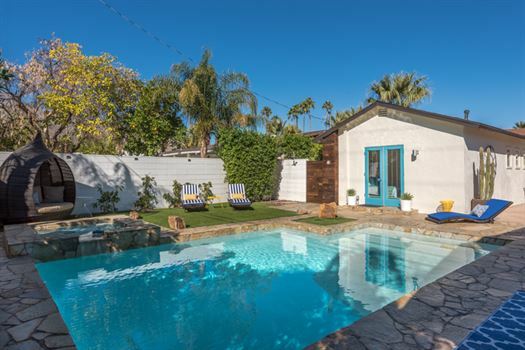 This house is a must stay if heading to Palm Springs. 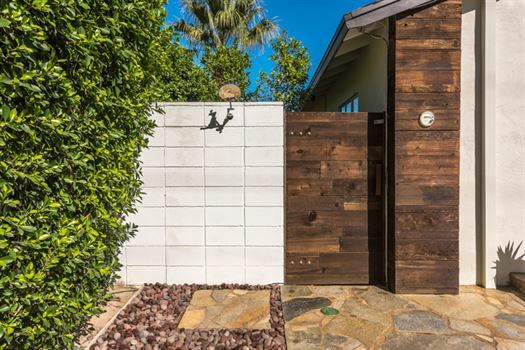 Our experience at the Indigo Dream Home was incredible! We were going with a group of 8 friends to celebrate my 30th birthday and I couldn't have asked for a better weekend. The space was exactly as advertised and it had everything that we needed for 8 of us to stay comfortably. The entire place was decorated beautifully! Eric, the property manager, was extremely helpful and quick to respond during our stay. We will for sure rent this space again next time we have a group trip in Palm Springs, something that may now happen annually. Thank you! 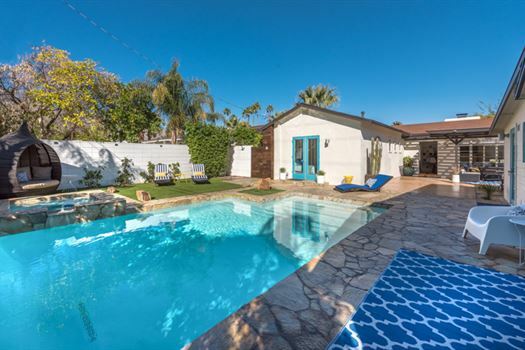 The house and casita were lovely but what makes this property a "five star" is the outdoor space. We never ate or cooked indoors. We relaxed by the pool during the day and cozied up to the outdoor fire feature at night. The location is an easy drive from wherever you want to be. Property manager was super responsive and informative. Perfect for a family getaway! The house was amazing!!! Our family loved the entire place. The pictures were an accurate representation of the house and it's space. We felt very relaxed and at home. The amenities we amazing. The fire pit has a breath taking view of the mountains. We really enjoyed waking and having our morning breakfast in the front dining space with the relaxing waterfall. 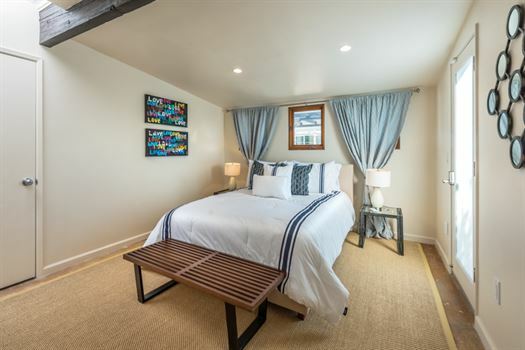 We've stayed twice in this home and have had a most relaxing time - the 2 bedroom house with the addition of the casita is ideal for three couples. The court yard is our favourite place to spend all of our time - reading, swimming, in the hot tub, on the patio for breakfasts and dinners, in the shade or catching a little sun, and around the fire pit with our wine every night. Not overly opulent but comfortable - a place to put your feet up and chill! Wonderful place, we will be back! Wonderful place, we will be back! It was perfect for us, two couples and two kids. The pool house worked as a separate house really! Definitely heat the pool, the spa gets super hot - is on a timer from 10am-10pm so doesn't turn on during the off hours, so inquire about that. The beds were comfy and the best thing of all, LOCATION, LOCATION, LOCATION - Ruth Hardy park, the airport, South Lykken Hiking Trail and the main drag Palm Canyon all all within minutes either walking or driving! Everything was great. People were friendly and the house was awesome. Great property in a quiet neighborhood! I took an extended vacation and stayed in the Indigo Dream Home for 6 wonderful weeks. I did not want to leave! My expectations were met and exceeded in all aspects. 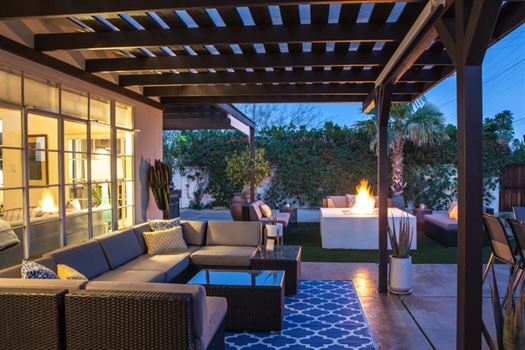 The home was comfortable and inviting and the very private outdoor space was amazing! 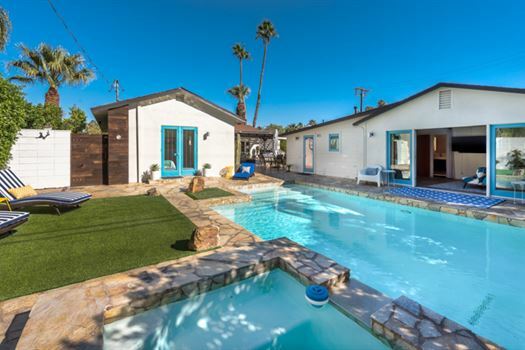 This home is perfect for entertaining guests or just relaxing on your own. I enjoyed the quiet, peaceful neighborhood on my daily morning and evening walks with my dog. Great location! The home was well stocked with anything I could ever need and Chris was always eager to help with any questions I had....thank you Chris! I would highly recommend this property! I wish I was still there! We had a fabulous stay at Indigo Dream Home. 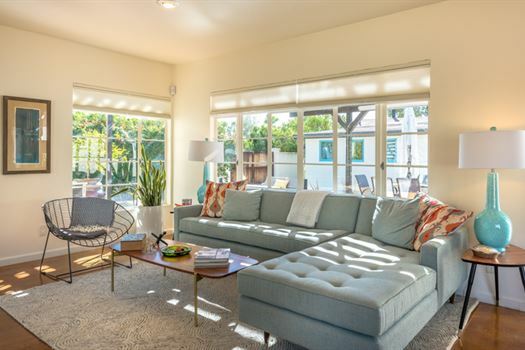 It is a lovely, light, airy home; beautifully decorated and charming. The kitchen is very well equipped with everything you could want. The grounds of the property are private and stunning, with lots of quiet corners in which to sit and read. We didn't want to leave. Stayed for two weeks with a friend on a golfing holiday. The house was well appointed with very comfortable furnishings, good beds and linens etc. An added touch was a pretty well stocked cupboard with spices , condiments , olive oils etc . Very private backyard with a nice pool and hot tub. It is a 5 minute drive to restaurants on Palm Canyon Drive . Spacious and warm and modern. 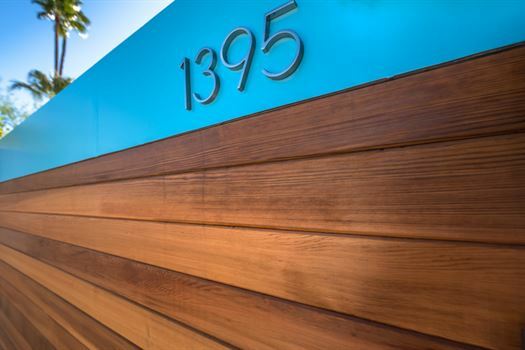 Great space, tasteful subdued artwork. Gas fireplace inside and out really made the trip wonderful. I have never stayed in a rental with such a well stocked kitchen.Hot tub takes 3hrs to warm, other than that it was so perfect. Love to come back next year.